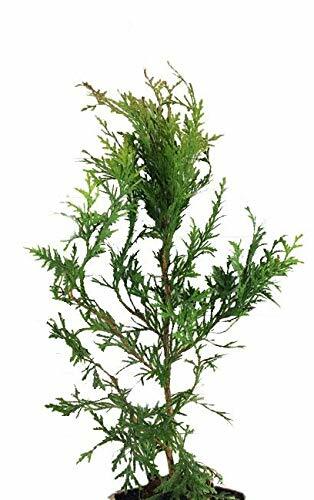 The "Green Giant" Thuja is a large fast growing evergreen that has been known to grow up to 3 feet a year. Its natural pyramid form makes an exceptional landscape tree. They can used for a screen, hedge, windbreak or a single specimen. Green Giant Thuja can grow up to to 50-60 feet high and have a 12-20 feet spread. They perfer moist, well drained soil, sun to partial shade, Zone 5-7. You are buying 10 well rooted, 6-8 inch tall trees in 2 inch pots. Starter Trees in 3" pots with soil and a minimum ht. of 8 inches. Mature height: 40-50 ft. Mature width: 20-25 ft.
Versatile evergreen plant that can be used as a border, a hedge or a stand alone focal point. If you have any questions about this product by Thuja, contact us by completing and submitting the form below. If you are looking for a specif part number, please include it with your message.